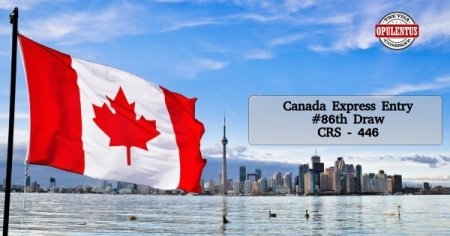 Immigration authorities of Canada have conducted the 86th Express Entry Draw. In it 3,000 candidates received Invitations to Apply to attain PR Status in all programs. The least Comprehensive Ranking System score in this draw was 446, which was 10 points below the 85 draw. It marked the 6th round of invitations using the Express Entry in 2018. By using the present new format, IRCC puts in place an exact number of invitations. Owing to the number of aspirants, who secure the minimum score, surpassing the numbers permitted, authorities take an action. They resort to the tie-break process, for issuing ITAs. The date and timing of receiving the Express Entry profiles determine it. Furthermore, the maximum number of candidates, who got the invitation, in one draw, since the change is 3,000. In the recent draw, the 3,000 profiles of the pool get a rank to become eligible to get the ITA. Through this format, the immigration officials exercise control in implementing a better method to select an exact number of candidates, who can get an ITA. Furthermore, there was no such provision in the previous system. Moreover, this draw continued the trend of having the minimum CRS score which is below 500. This is the 19th draw after modifying the Express Entry CRS on June 6th, 2017. The system of Express Entry was implemented by Canada on January 1, 2015. It manages Economic programs for skilled workers which include the Skilled Trades Program, the Federal Skilled Worker Program, the Canada Experience Class and the Nomination Programs of the Provinces. There is an expectation that 30 draws would be held and nearly 70,000 aspirants will be invited in this year. Given that, many draws are based on a CRS score below 450, the authorities can meet the immigration targets. Hence, this draw means that the Employers need to consider securing an LMIA or a provincial nomination to opt for retention of employees on a long term. This also means that a majority of Candidates will require a CRS score lower than 450 points facilitating a considerable number of applicants to seek permanent admission to Canada.